The salty musings of a kind of obsessed, but totally amatuer ocean swimmer. Hey there! Thanks for dropping by Not Quite Nemo! Take a look around and grab the RSS feed to stay updated. See you around! I had a friend contact me yesterday to ask advice on waterproof cameras. I immediately started looking up the blog post where I’d reviewed mine…only to find it gathering dust amongst some old drafts! Seems it’s well overdue that I should review the camera I’ve had for months and months. After my Pentax camera leaked, I decided I really couldn’t live without a waterproof camera. There were a few things I didn’t particularly like about the Pentax, so I decided to do a bit of research. I ended up going with the Nikon Coolpix AW100. I have to say up front, I LOVE this little camera. For beach and underwater shooting it takes a consistently great photo. They always have nice sharp focus and pretty faithful representation of colours. One thing the steered me towards this camera is that it goes to a depth of 10m. Most of the other waterproof cameras on the market tend to go to 5m, which is fine if you just want to use it for swimming or on boats, but I was hoping for something I could use when diving as well. It’s the small things that count sometimes. I love that the shutter button is big and textured, which makes it really easy to snap off shots in the water, even with cold hands. With my old Pentax you had to press down quite hard on a small button and I missed a lot of shots that way. This isn’t a problem with the Nikon, and it’s easy to feel when you’ve taken the photo. I’ve taken it diving and found it really easy to use in that environment as well. The screen is also easy to use in full sun and glare. I know I’ve played with the Sony equivalent and the screen is very difficult to use in bright light. The battery/SD card housing is pretty secure with a twist and unlock set-up that’s still easy to use. I’m pretty careful about rinsing the camera off and drying it again before opening, though, as I’ve tried opening it straight from the beach and felt grittiness from sand in the mechanism. I don’t think that would be a good think to keep doing at all…a recipe for a leaky camera. If you want to check out some of my photos taken with this camera, you can have a look over on my Flikr account. I get a lot of traffic here from people looking at my review of my Garmin Forerunner 10. For the full review, please click on the link and go read that first, but a few months on, I have a few more insights to offer, so I thought I’d add this follow-up post. First point I’d like to make is that I have a couple of friends who also purchased this product and have given it a go swimming. I seems the issue with calculating the distances is worse than I initially thought, and that everyone I know who has one of these experiences the same thing. There doesn’t seem to be any logic to it at all. The rest of the points I’m going to mention are because of the fact that I recently borrowed a generous friend’s Garmin 910. That watch, although quite a bit more expensive is worth every penny. The distances were detailed and spot on and could more sharply contrast with the forerunner 10. I also loved the haptic feedback of the watch vibrating when it found the satellite and if it lost it. One of the main problems I have with my Garmin is that I switch it on to find the satellite, and then forget to hit start. This is completely not an issue with the 910. I also loved the extra features of the 910 in how it understands swimming, including your stroke rate. So, sorry to my poor old Forerunner 10, I think I’ll be passing you on to a runner who might appreciate you more than I do, and adding a 910 to my birthday list. Last Sunday, though I did the Shark Island race, I saw neither an Island nor a shark. Seems the term “Island” is a bit of a misnomer. It’s more of a rocky outcrop, that’s exposed at low tide. It wasn’t low tide for the race, so all I saw was a bit of white water as waves were breaking on my right when the coast was on my left (ie I was swimming between the “island” and the shore. Ah Cronulla, I do love a good race South of the bridge. There was a bit of competition with 3 different races on in the greater Sydney area for what is effectively for most (sane) people the last racing weekend of the season. The 4SEASons crew were split and managed to represent at all three locations. For my money, though, being from the inner west and making so many treks OTB (Over the Bridge) to the North shore every summer, I do like to support any events on the South Coast. I can’t say I was disappointed. Given the number of races scheduled pretty much every weekend over the summer and early autumn, it seemed like a pretty reasonable thing. In reality, however, with the crazy conditions, postponed and cancelled events this season, that was tougher than it had looked. Last weekend of the season and Ro needed to do the double up to hit her 20km, and if we both did a double we could hit our team goal. The race itself was a good one. The pre-race registration was a little odd…the 1km and 2km registration and tag pick-up venues were in different locations. And there were different messages for double-ups in different age groups (Ro was given her timing tag and cap for both event, but told to come back after the 1km to have her second number written on her arm! Huh?). I caused all sorts of confusion (in both locations) because I headed straight to pick up my tags before heading down to the beach. As I was still wearing my motorcycle boots, I declined the offer of the volunteers to put my tags on my ankles for me. It’s OK, really, I’ve done it before and take full responsibility for my own tag, guys. On the up-side, I did really like the idea they had, which I haven’t seen elsewhere before, that we wear both tags for both races and then get them both cut off at the end of the second event. As someone who has lined up for the start of the second race only to realise I hadn’t put on my second tag, I thought this was a stroke of genius. Of course, this was offset by the second “bright” idea of having different cap colours for categories in different events. Yes, two crappy latex caps in different colours and needing to remember to change them in between. Gold. Or not. Admin aside, the race itself was nicely done. The course was well marked and water safety was plentiful and helpful. I had planned on going out super-easy in the 1km event, but around the first can I found myself next to Ms Priceless, who is usually much quicker than me, but was struggling with both a touch of the lurgy, and the fact that she had attended a wedding the night before. 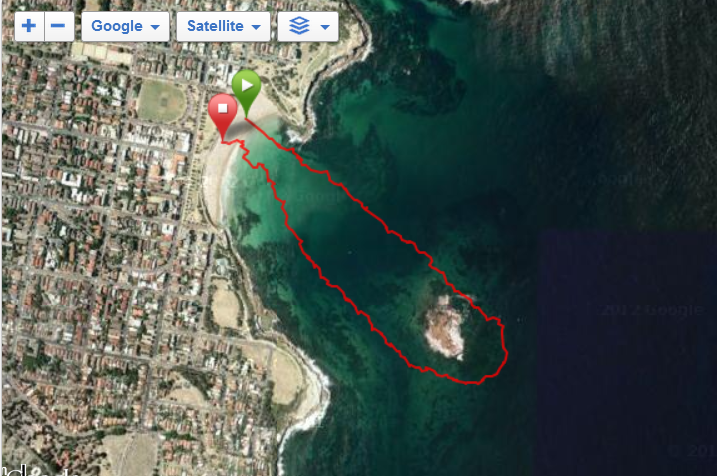 And had flown back in that morning only to head straight down the coast to Cronulla to race. That girl is dedicated!! I do love having someone to pace off, and in particular love it when it’s someone I train with. (In fact it was the early-seasons Cronulla event I swam entirely with Ro…coincidence?) I resolved to see if I could keep up for a while, and ended up pushing myself quite hard as I found myself sticking with the pace all the way to the finish line. The second event was particularly lovely. The “island” may not have technically been an island, but the rocks provided a perfect playground for critters and there was plenty to see. I was pretty happy and comfortable and managed to have a lot of fun for about the first 2km. On the home stretch I noticed a nasty twinge in my right shoulder. It got reasonably painful towards the end, so I didn’t finish quite as strongly as I would have liked to. I’m blaming the house-painting (it was my right shoulder) and praying it’s nothing serious 3 weeks out from my team tilt at the South Head Roughwater. The day was so lovely, in fact, that Ro, Sonja and Marty (Sonja’s husband who is yet-to-be convinced to join in himself, but is a regular supporter) found ourselves some take-away burgers and chips and had a pretty divine lunch in the park. What a day! So here’s the link to the full set of pictures from the fabbo day! If you enjoy them half as much as I enjoyed the swim you’re in for treat. Ah Coogee…one of my favourite beaches and one of my favourite races. Swimming out and around an island is definitely fun. Once you get out near the island you can start seeing the bottom again, and all the fishies. And there just seems to be something kind of primal and basic about swimming out to an island. Inspiring the explorer spirit in all of us. It was a beautiful day again. Autumn seems to be succeeding where Summer failed as far as delivering gorgeous weather for event days! This was a pretty long day for me as I did the 1km event followed by the 2.4km. It’s the longest I’ve done, but the arms held up pretty well (despite a bit of a case of house-painter’s arm!). The 1km was a bit of an interesting start. It was scheduled to start at 9.15 so just before 9 we headed over to near the start line for a briefing and a warm-up. Well, it turns out the organisers decided to start the race early. 15 minutes early. Where was I when this happened? Out past the break still warming up! The start waves were divided into under 40 and over 40…so I had missed my wave start. Well, there was only one thing for it, I cut across in a curve to intercept the pack. As this was a long event, I had already planned to take it a bit easier on the short course. The stuff up with the start wasn’t such a big deal for me, but it did mean I didn’t start my Garmin so there’s no map for that event. The 2.4km was much better on that front, and I managed to get to the line and start with the rest of the crowd this time! Ah, I do love this race. There were a lot of people participating this year…all grateful that there are finally some swimmable events! I like the course, and it was well laid out. The water safety were plentiful and helpful. The only problem in the end was a stuff-up with results for a bunch of swimmers being left off. Oceanswims have done a great job of trying to figure them out from the photos taken at the finish line, but it’s really, really bad to have a problem like that in the first place…hopefully lesson learned for next time! Excuse the bad swim hair! So all in all, a great day out. The season is winding down now….no swims next weekend (well, none close enough to be do-able), then 2 more to go. Time to start thinking about off-season training and winter swimming! I’ve written a bit before about Zoggs. 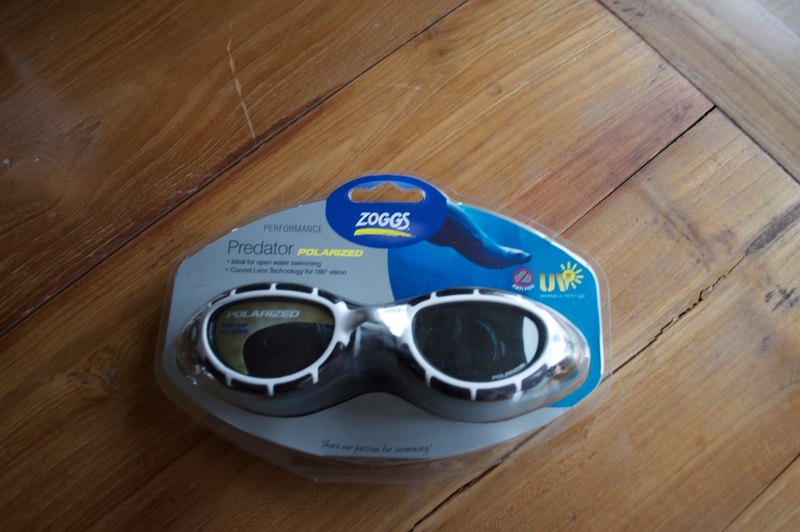 Firstly I reviewed my favourites the Zoggs Predatorflex polarised. Then recently a new model was released so I reviewed the slightly different black version. Well, it seems that at the same time I bought the black model, I may have also accidentally bought the other new offering – a photochromatic or transition lens goggle. I wear transition lens glasses when riding my motorbike and am a huge fan of the versatility under different conditions, particularly when you’re in a situation where you can’t just take sunglasses on and off. So I was prepared to love these. I really hoped to love these because they’re also substantially more expensive than my usual goggles. I’ve trained in them a few times now and raced in them at Queenscliff so thought these’s only one thing for it…it’s time for a review! Here’s a list of the pros….. These lenses are clear and the transition works pretty well. They are advertised as taking 2 mins to transition to new light levels. This is supposedly so you don’t get anything weird happening as you turn your head in and out of the water to breathe. I don’t know of any other company doing this type of thing, and I have to say it’s a great idea….especially for longer races where conditions may change and/or might be different at different legs of the course (ie facing into or away from the sun). They do come in a very fancy and sturdy zippered hard case. It’s even big enough to fit a spare pair of other goggles inside! Plastic zipper so no rusting. 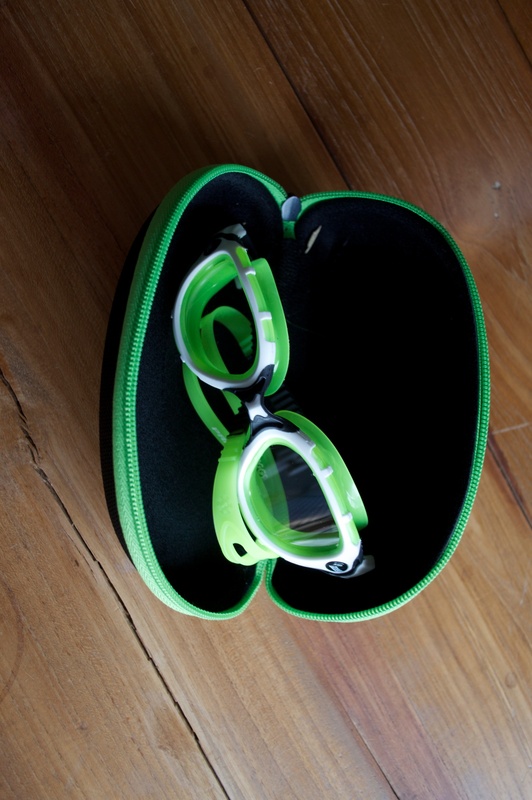 All goggles should come with cases like this! These fit nicely and have the ratchet straps that Zoggs never should have abandoned with their black model. Width is good again, like the originals. And of course the cons……. Not really many. I think the time it takes to transition could be a touch quicker. 2 minutes just felt a bit long as I came around a can and into full sunlight at Queenscliff. Just being picky here. I know I can’t have everything, but can’t aI have goggles that are transitions lenses and polarised? I have certainly noticed you can’t see as clearly or as deep into the water. The big problem with these, though, is the price point. At around $60 these are around 3 times the price of my regular goggles. So in summary – these are great. Really great. Clever idea and executed very well. Buuuut….are they 3 times as good as my regular goggle? Well, I can’t really say they are. I love them, but I’m not sure that I love them enough to make them my regular goggle. If I was a millionaire or sponsored or something, I’d always keep a pair handy for those days when you don’t know which way the weather will go, but for now, honestly, I’ll probably stick with my old faithfuls. If you want my general thoughts on goggles, I’ve written about them in a previous post. In case you’re wondering, this is not a paid endorsement, just my opinion. I imagine I’m about as far from commanding paid sponsorships as you can get…short of not swimming at all! Bondi Bluewater Race – See it Live! I’ve already done my race review of the Bondi Bluewater event from Easter. Seems a very clever someone immortalised the race their own way and did a magnificent job of it! If you haven’t already seen it doing the rounds, please hit play on this…it’s a wonderful lens on the ocean swimming experience, complete with 4SEASons and Can Too swimmers and wardrobe malfunctions (fortunately not on the same person!). If you happen to have come here wondering what it’s all about the video above is the best thing I’ve seen to show you (short of jumping in the water and giving it a go!). Well done to the very clever fellow who made it. After recent craziness in my life, I took the afternoon off after training Saturday morning, napped on the couch and actually watched a DVD. It was heavenly. In the evening Mr Nemo was out of the house, leaving me with sole responsibility for the remote and menu choices for the evening. Healthy dinner, no alcohol (after Freshwater I learnt my lesson) and an early night. As a result, I woke up feeling like a million bucks! Even better, the sun was shining, and the ride to Queenscliff was gorgeous. I arrived at the beach found my crew, and together we marveled at the beautiful day. The first race was touted as an 800m event. In the end I think it was a little longer than that…and for me a little longer again as I managed to come in way wide of the finish line. Not entirely sure how I managed that as I had no idea I’d even done it until after. No excuses, either, the conditions were pretty friendly. I went hard in this and treated it as a sprint. I am so not a sprinter it was perhaps that that threw me out! The toughest part of the Queenscliff event was the start/finish. I haven’t swum there before, so not sure if it was just because of a low tide, but the run out (and then back in at the end) was loooong and very bumpy. Anyone who managed to not stack in one direction or the other was definitely the exception rather than the rule, and I was certainly not one of them! It was also pretty hard work for people like me who are definitely more comfortable putting in their effort in the water instead of the sand! The other trick was in the short course – keeping your cans in order. The way the course was laid out had one of the cans ready for the long course in a very awkward spot. Differentiating the difference in colours between orange and red wasn’t really that easy once you’re in the water and only head height! Other than that, though, it was a cracking day. The longer course was also very enjoyable and it was so nice to be swimming in the sun again! It was a little odd for a while as there must have been a delay in getting the last wave started. 20 minutes in and I hadn’t been passed by the leaders of the age group behind me…I was starting to get a little paranoid that I was swimming way off course or something! I have written (probably more than once) about my favourite goggles, the Zoggs Predatorflex polarised. I love them, and have converted many people to the joys of polarised lenses and a good fit. You can imagine my excitement, then, when I discovered there was a new model of Zoggs Predatorflex…different colour option and everything. I’ve had a chance to wear these a few times now and have raced in them once, so thought it might be time for a review. These have the polarised lenses I love. You can see so much more, particularly if you’re interested in checking out the local inhabitants below the surface. Plus they cut glare without sacrificing clarity. The lenses are actually a bit darker than those on the older model of predatorflex. This is good for super-sunny bright conditions, and I feel like when I’ve worn them in those conditions they have helped my eyes not get sore. Like the previous model, they seem fairly resilient. They don’t seem to scratch or wear too badly. These goggles come with a cloth pouch instead of a plastic case. I’ve put them in a different one, because nothing lasts long in the bottom of my swim bag without decent protection. Sand is amazingly abrasive. The lenses being dark, they wouldn’t be much good for pool sessions, or in really low light. For some reason, this model replaces the ratchet strap with a double elastic string around a plastic closure. I cannot fathom why as I hate that and think it’s a big step backwards. I like to be able to tighten and loosen the straps for different conditions. In particular this worked badly for me at the Freshwater race where they came off my head (I would have tightened them up at the start of the race if it hadn’t been such a pain) and I had to finish with no goggles (they turned up later, thanks sea-gods!). These seem a bit wider than the previous model. This might actually work well for the bigger blokes out there, but I found they were a touch wide for my face and this affected the sealing ability. I had a bit of a leakage problem when I wore them at Freshie. I can’t see myself racing in these again, so might give them to one of the guys I train with to test out. So in summary – not a bad goggle (apart from the straps! ), but probably not very likely to make their way into my shopping cart again. If I were a guy or had a wider face, the story might be different, though. The Bondi Bluewater seems to have been a long time coming this year. Originally it was slated to be the 1km and 2km Can Too goal swim in February. There was some sort of problem with the council so it was rescheduled for later, only to have it postponed again due to poor weather and conditions. The thing is, this race is to support the Bondi surf club (as opposed to the North Bondi Surf club who run other Bondi events). So this is to support the amazing men and women who volunteer their Saturdays all summer to provide the all-important water safety for the Can Too swim program. So even though the Easter Sunday swim wasn’t the most convenient, I was still very keen to do this event. Since there was a combo entry to this with a previous event, I have also been entered forever to double up. However, when Sunday actually rolled around, I was (due to an insane number of things packed into my Easter) kind of exhausted. I did manage to drag myself out of bed, but took an executive decision with myself to bail out of the earlier 1km event, and show up for the 2.1km long course. Once I arrived at the beach, it was, well, a little somber. The usual buzz and atmosphere of an ocean swim event was a bit lacking, and numbers were definitely down. To add to that, it was a little overcast and grey. I’ll start with the water temperature….it was just perfect! The water was clear, and there were a few little rolling waves into the shore for a nudge at the end, but no sign of chop or anything too tricky at all. The race was well organised and the course was clearly marked, and the fruit and water set-up at the end of the race was excellent. I raced, well, OK. Not bad, and last season I would have been happy with my time. this year, however, a little quicker might have been possible, but there are a few events left on the calendar for me to see what I can do about finishing the season with a PB. A very good effort from Bondi surf club, though, despite all the challenges…well done!! MS Megaswim 2013 – Part 1 – Where it all began.